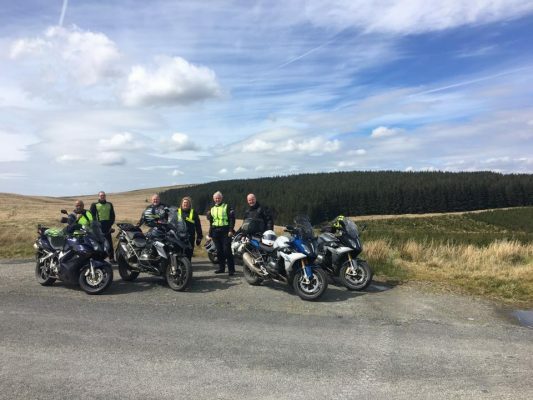 As part of our commitment to help riders get the most from their riding, as well as helping them improve their riding skills we run a couple of extra special events each year – our “Training Tours”. These typically see us base ourselves for a couple of nights in a good quality hotel in the heart of spectacular riding country, where we will relax in the evenings reflecting on the day’s riding. The evening before the tour we hold a participant’s meeting, where you will get to meet your fellow riders as well as allowing us chance to run through the structure of the tour in more detail. This meeting includes our first pre-ride theory session, exploring advanced riding techniques appropriate to the first day’s ride. We provide participants with their own “route notes”, as we don’t ride as one big group, preferring riders to ride in small groups or on their own, so they can ride at their own pace and focus on their riding rather than trying to keep up with others. Each day we schedule a number of “regroup points” where we meet up over a coffee to discuss the ride. During the day, our instructor(s) will ride with each rider or small group of riders to help them put the advanced riding theory into practice, based on their individual skills levels. At each regroup point the instructor will provide feedback to help the riders further develop their skills as they continue the journey. In the evening there will also be a short re-cap of the day’s ride and the key learning points from the day, before we head out for dinner and a relaxing drink. After a hearty breakfast the next day begins with another pre-ride briefing before repeating the process above – and with a route chosen for its scenic beauty as well as its challenging and enjoyable roads the riding is bound to be enjoyable as well as educational! When the tour is over, we will send you a riding report, outlining the key learning points from the tour, as a reminder of what you have learnt and helping identify any suggestions for further improvement. Each tour has limited availability, with a maximum of 8 riders per instructor – and all our instructors hold advanced riding instructor qualifications, so you can be assured of the highest quality training. To book your place on either tour, or for more information, call 0161 914 7509 now! To book your place on either tour, or for more information, call 0161 914 7509 or email admin@innercircletraining.co.uk now!